I'm on vacation at Topsail Island, North Carolina, so this week I'll post a variety of pictures of the strange signs, advertisements, and labels I find while here. And as with many vacation spots, this one is filled with potential fodder. Many beach houses have distinctive names that usually say something about their owner's personality or hobbies. 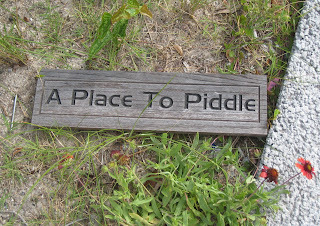 While jogging yesterday morning, I came across a sign for "A Place to Piddle." Curiously enough, the sign had fallen off and was lying on the ground. Despite the sign's urinary invitation, I resisted the urge to relieve myself right there and then. If I was a guy, I SO would've done it.